Corporate Citizenship Award granted to LOTH, Inc.
LOTH, Inc., was recently named a Corporate Citizenship Award finalist for the second consecutive year (formerly referred to as the Corporate Caring Award) by Columbus Business First. They are among 160 central Ohio companies that completed a survey quantifying the time and money that they and their employees donated to area non-profits this past year. LOTH Columbus takes pride in their philanthropic efforts and enjoys getting as much of their team as possible involved to turn a fun event into a great cause. 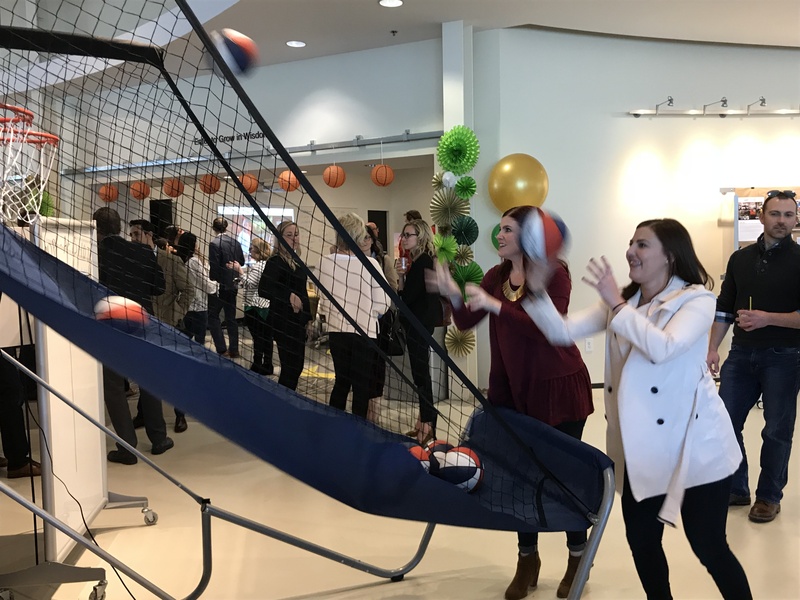 LOTH Madness provided the fun with a Pop-A-Shot for friendly competition among our employees and their clients. For example, LOTH Columbus held their 2nd annual LOTH Madness event in March to raise money and awareness for the Five Strong Foundation. The event shows live March Madness games, a Pop-A-Shot provided some friendly competition, a split-the-pot raffle benefitted the foundation, and the event was catered by Condado along with craft cocktails were on hand from Reno Reserve. Other non-profits that LOTH regularly partners with include the Nationwide Children’s Duck Race, Pelotonia, Race for the Cure, IIDA Product Runway, Dress for Success, Columbus Derby Day, Salvation Army’s Adopt a Family, and Common Ground Free Store. This year LOTH looks forward to adding on to their efforts with Meals on Wheels. The Columbus team will be delivering meals over their lunch hour on a weekly basis. During the summer, LOTH will be transporting furniture from their previous showroom space on Grandview Avenue to the local corporate office of Habitat for Humanity. Since LOTH’s recent renovation, transforming their showroom into the updated Grandview Work Studio, several pieces of furniture that were featured in their space will now be re-homed with Habitat. LOTH fosters a culture that proactively encourages its employees to become immersed in supporting worthy causes and non-profit activities. The leadership team furthers this with its own support (time and money) to local charitable foundations. The LOTH leadership team and employees both invest in causes they care about and are quite effective at mobilizing others. With financial contributions, charity walks, raffles, drives for clothing, school supplies, etc. – everyone has the opportunity to contribute in their own way. LOTH’s foundation of serving the community is a culture of giving that runs deep in the company’s DNA. To view all of the finalists, visit Columbus Business First online.